Of the many weird Alaskan laws (which forbid giving moose alcohol) there’s no age restrictions on children drinking so long as it’s not served in a bar or public restaurant. The same’s true in the UK, and even extends to 16 year olds being allowed to drink beer or wine in restaurants so long as someone of legal drinking age buys it for them. No profane or immoral songs are allowed to be sung on any street in England. If only this were true all over the world, we wouldn’t have to put up with the screeching and sloppy crooning at closing time. Given so much liquor is distilled in the state (both legally as well as illegally), you’d think Kentucky would be pretty relaxed about it’s alcohol consumption laws. Unfortunately that’s not the case. Most of Kentucky is uncharacteristically dry on a Sunday, and whenever the polls are open for local and national elections. Probably a good idea given what we’ve seen on Justified, which I’m sure paints a completely accurate portrait. 5. Gotta Be North Dakot-ing! In what can only presumed to be an effort to stop a decline in booze prices and reduce intoxication, it’s illegal to apply coupon discounts to alcohol in the oil-rich state. Massachusetts was probably hoping for a similar outcome when they introduced a drinking law making ‘happy hours’ illegal. Given the number of hard-drinking Irish decedents in the state this might not be working as intended, but is instead a boon to the economy, making Boston alone over a $1.3MM per hour when drinks aren’t discounted. 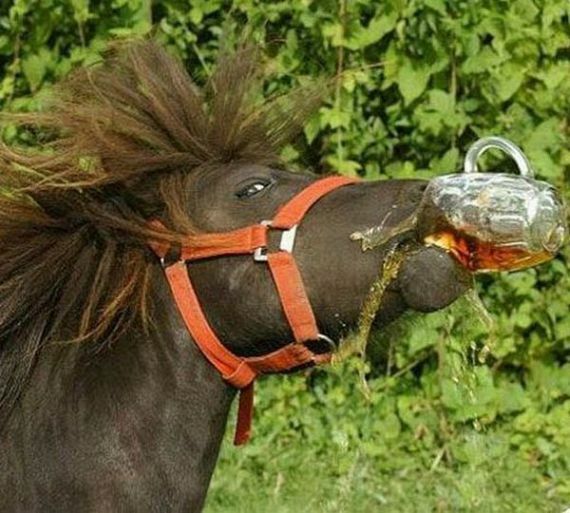 In the great state of Colorado, it’s illegal to drink while helming any vehicle, including horses! So no drinking at the wheel of any boat or car sounds like a pretty solid plan, as an Englishman, I couldn’t imagine anything more American than a cowboy drinking a Budweiser on horseback. It’s illegal to be drunk and in charge of a cow in Scotland. It carries with it a fine of £1,200 (~$2000) not including any expenses in caring for said cow. I can only hope the same is true of sheep in Wales. In Germany no-one can be accused of being legally intoxicated during Oktoberfest. The Bavarians are a hardy people though, it takes a lot both to get them drunk and to sober them up; best just to let them get on with their day. In Oklahoma, beer over 4% must be sold at room temperature. As a Brit, that warms the cockles, and would make me happy except I’d be in Oklahoma and I’d probably be served larger or pilsner. Why you no like Ale, America?